We’re pretty excited to share the world’s first look at the gameplay of Just Cause 3 with all of you here on PlayStation.Blog. Every explosion in the trailer pretty much speaks for itself, but before you hit the play button, there’s really only one thing you need to know: this is 100% gameplay, captured using cinematic camera angles. There is no scripting or staging, and you’re not watching cut scenes. Got it? Okay, now you can hit play. If you’re a longtime fan of the series, did you pick up on anything new? There are definitely a few nods to some of the ways we’ve upped the ante in Just Cause 3. And that’s just the tip of the iceberg — all this fiery chaos is really only a glimpse of the mayhem you’ll be bringing to the beautiful countryside of Medici, currently under the iron boot of its despotic ruler, General Di Ravello. But that’s where Rico Rodriguez, you, and a whole lot of firepower come in, right? And if you’ve never played Just Cause before, welcome aboard. Strap into your wingsuit and get ready to dive into restricted airspace, answer guns with even bigger guns, and tether a bus to a helicopter. More to come. Crazy that avalanche is giving us Mad Max and JC3. I believe the NY studio is developing Max and the Stockholm guys are making JC3. Until recently I never realized avalanche was such a large independent studio, thank you avalanche for being so awesome. That’s not “gameplay”. I think we all know what gameplay looks like : Like someone actually playing the game. Trailer looks good, would’ve liked a continuous clip from the default camera angle though. Do we have any specs we can confirm? I’m assuming 1080/30 and about 30gb game size. Please tell me u guys are optimizing it to be as good as possible for each system, do not utter the word parody as it is just copout to build it to the lowest common denominator (the xbone). Hey ms spent 2.5bil on Minecraft, can Sony throw some dollars at Avalanche to make them and their ip a part of the family? One of my favorite things about Just Cause 2 was how it allowed you to capture and save game footage (which really came in handy for those once in a lifetime moments!). I can definitely say my Share button is going to be seriously overworked when Just Cause 3 releases. Never played a Just Cause game before,I do have Just Cause 2 that I got for free with Plus but didn’t have time to play it yet….I gotta say though that JC3 looks good.I’ll be waiting to see gameplay in action,not just a trailer but after seeing that Mad Max trailer…damn I have faith in you Avalanche. @ 3 MarinoBrea – Thats why its called gameplay trailer…not just gameplay.Those were clearly shots of gameplay,just taken from another angle. @3 Are you kidding me? People that visit the blog can be so thick sometimes. Clearly you don’t know the difference between a montage of gameplay and a prerendered scene that most publishers try to push out to consumers, hoping that they drool over a product image that will never see the light of day. Man, some people on the PS Blog should just find somewhere else to troll. 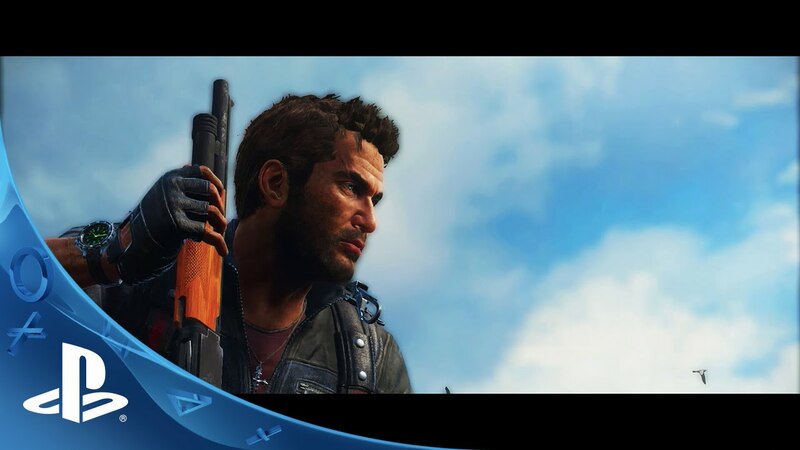 This is a fine trailer, and Just Cause 2 was too great of a game to miss a sequel. Mad max gameplay trailer showed a lot more. Yes, this game is why they invented share buttons – oh the glorious insanity we will share. Looks like a blast! I loved JC2 on 360 and with the switch to PS4 and next gen I think Just Cause 3 can be beautifully destructive! I heard some talk that MP wouldn’t ship with the game but COULD be a post launch addition, I really gotta agree with a push for that. I think causing mayhem with friends in a coop mode in the open world with coop missions just makes sense In a game like this. I wouldn’t even advocate for split screen which I usually do, I don’t think you could render that twice, but even just a straightforward online drop-in/drop-out coop for at LEAST 2 player coop would be the ultimate! Played JC2 liked it a lotbesides some minor glitches (a long while after release and updated) and way too much completion not tied to the main story directly, aka there wasnt a nice flow. Still have the disc, sorry though I need reason to believe this installment takes it to the next level for me to buy. Especially on next gen. It looks the same as the last one to me. Including the mapping. On the fence, need to keep an eye out on new info. Other then that. I’d catch it on a big sale if it doesn’t wow me. PS+ did its job for this franchise. I never intended on playing these games, but after JC2 on PS+, I am ready, wallet open for JC3 and any DCL for this game. I ended up enjoying JC2 more than any other open world game on PS3. IMO, this is what games are all about, rediculous out of this world fun, that only games can bring. JC2 was SO bad, I can’t imagine how this franchise is still alive. This game was the shii back in the day cant wait!! now that we have just cause 3 when will we see mercenary 3. i want to play with more nukes. @15 – The franchise is still alive BC Just Cause 2 sold over 6 million copies. Probably half of these were 4$ steam sales but still 6mil is 6mil. Not bad but i’ll wait until the game is £15.00. I must say mad max looks alot better then this. But unfortunately I will not be buying this game this year because of The Witcher 3, Arkham Knight and Metal Gear Solid 5. Those three games alone will keep me focused and entertained all this year. Was this game made by Michael Bay ??? Just Cause is truly a game where anything is possible. I’m a big fan of the franchise can’t wait to pick it up.